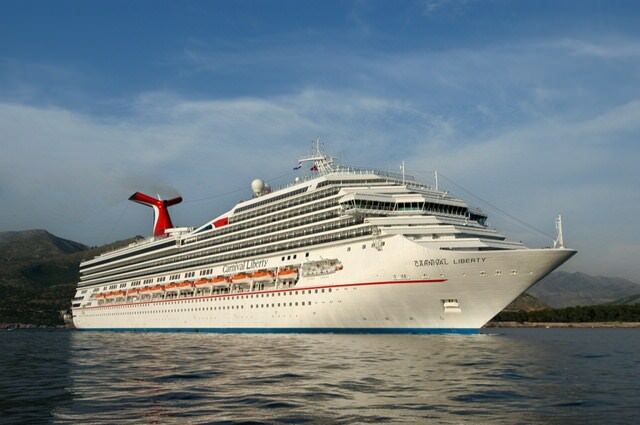 One of six Conquest-class sisters, the bright and playful 110,000-ton 2,974-passenger Carnival Liberty is centered on a glittery, nine-deck-high atrium, where the bottom-level bar is a great place to meet or people watch. A giant octopus-like chandelier is the focal point, its “arms” supporting light bulbs that continually change color. 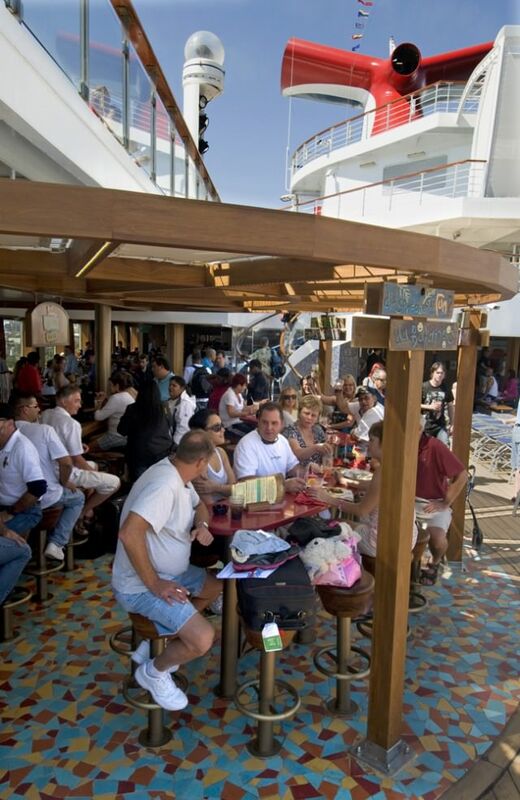 In late 2011, Carnival Liberty became the first recipient of Carnival’s ambitious FunShip 2.0 Enhancement Initiative, a $500 million-dollar program that saw the addition of new bars, lounges and eateries like Guy’s Burger Joint; the Red Frog Rum Bar; the BlueIguana Tequila Bar; the BlueIguana Cantina; the EA Sports Bar; and the Alchemy Bar. Carnival Liberty also received a top-to-bottom soft refurbishment of all upholstery and carpeting in both staterooms and public areas. In all, the ship offers 22 bars and lounges, from a boxing-themed sports bar to a giant disco with a tattoo theme and bar stools shaped like hands, to a piano bar and an elegant wood-paneled lounge with leather club chairs (and a smoking section). The Paparazzi wine bar is all about photography, with a giant 3-D collage of celebrity photographs covering the walls and images of cameras on the ceiling and bar front. The casino packs in almost 300 slot machines and about two dozen gaming tables. The three-level theater is the venue for pull-out-the-stops Vegas-style song and dance productions accompanied by live orchestras. 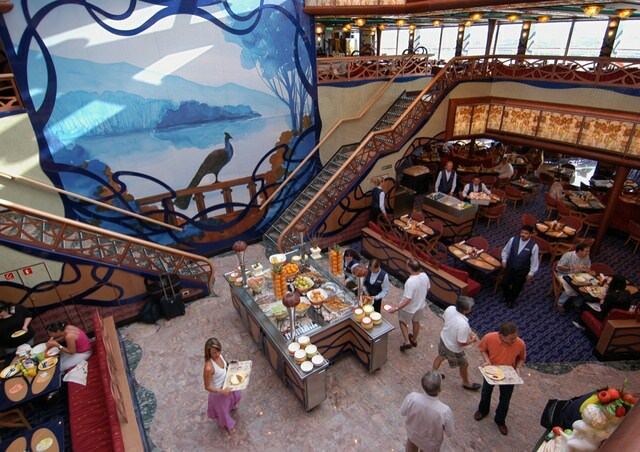 The Lido Restaurant aboard Carnival Liberty is Carnival's casual eatery. Photo courtesy of Carnival. Dining options include a pair of two-story main restaurants as well as an intimate, extra-cost steakhouse serving USDA prime aged steaks and seafood for a mostly adult clientele looking for a more upscale experience. Meals are also served in the two-story lido buffet, where you’ll find separate stations for Asian and American dishes, deli sandwiches, salads, pizza, burgers and more. The four swimming pools include the main pool flanked by a pair of huge hot tubs, a stage for live (and really loud) music, and a giant movie screen for videos and ship events. A 3-deck-high spiral water slide takes thrill-seekers on a 214-foot-long ride. The 4,200 square-foot Children’s World playroom has an arts-and-crafts station, video wall, computer lab, PlayStation games, and lots of toys for younger children. Hard-to-please tweens have their own separate space and so do teens, theirs with a soda bar and dance floor flowing into a huge video game arcade with air-hockey tables, which is open to all passengers. Kid of all ages can have a zap-fest in the inflatable laser tag arena. The oceanview gym is stocked with the latest exercise machines, while the Cloud 9 Spa measures 21,000 square feet and boasts 17 treatment rooms, plus an elaborate thermal suite and thalassotherapy pool. 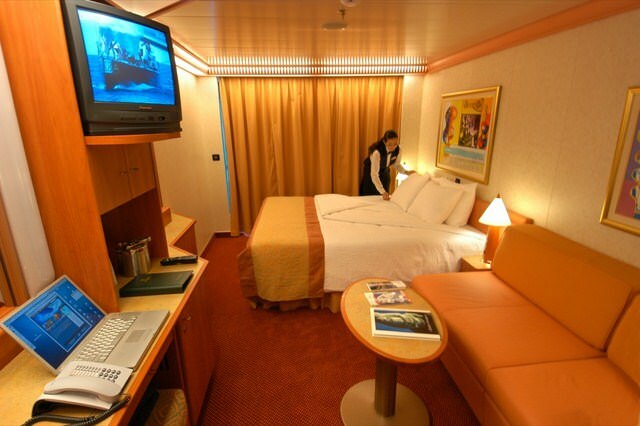 Staterooms aboard Carnival Liberty, like this Outside Balcony Cabin, boast warm colors and comfortable furnishings. Photo courtesy of Carnival. As big on cabins as it is on fun, Liberty offers standard outsides that measure a roomy 185 to 220 square feet. The amenities include stocked, pay-as-you-go minifridges, robes to use, and super comfy mattresses and bedding. On Carnival Liberty: Can You Have Too Much Fun?